Law firms deal with a high volume of records and a complex set of ethical rules and outside regulations. As software tools age and/or sunset completely, firms will need to evaluate whether their current technology and processes are meeting their records management needs. 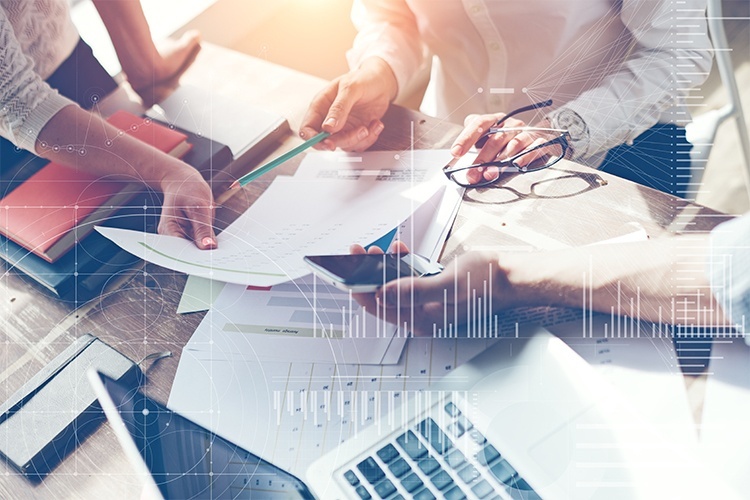 Here are top considerations for law firms as they evaluate technology upgrades for their records and information management. Upgrading your firm's records management software means moving all of your legacy data into a new system. It's important that your new software provider understands how to execute this process in a secure and efficient manner. Our team has handled countless migrations from decades-old systems and has experience working with IT departments to ensure all of your data is migrated easily into your new platform. Managing a high volume of records with various retention periods requires a software tool that can handle multiple records series and automatically calculate both time and event-based retention dates, such as matter close date + retention period. This functionality should also include support for legal holds and disposition approvals, assuring a defensible, visible process for managing records according to the firm's retention schedule requirements, as well as any local, state, and federal requirements. 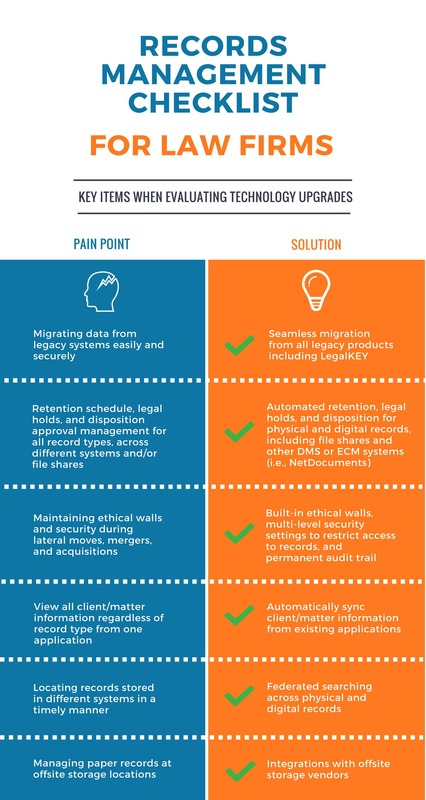 With lateral moves on the rise, it's becoming more important for a firm's records management software to support ethical wall functionality to ensure client and regulatory compliance. Built-in ethical walls also protect firms by restricting access to sensitive information, including PHI/PII. For firms with client/matter information stored in existing applications, it's important to select a RM software solution that can automatically sync client/matter information. This saves firms time and money when they can add software products to augment their processes. Built-in ethical walls along with role-based security features dramatically reduce the risk of unauthorized access to sensitive information. These security features enable certain groups of users to restrict access to any record and/or any field in the application, even particular practice areas or office locations for an additional layer of protection. The ability to generate standardized document types related to each matter can reduce manual data entry and streamline overall client/matter document management. It's important to look for a solution that can provide federated searching - meaning the search includes all record types, physical and digital, and records located in other systems, such as NetDocuments. This ensures that all records are included in your search results so nothing is lost or overlooked. Records management software integrations with leading offsite storage vendors such as Iron Mountain, O'Neil Software, and Andrews Software allow administrators to manage all activity, i.e., request file transfers, pick-up, and even destruction of records without leaving the application. This means all of these actions are also captured as part of the software's permanent audit trail. A barcode/RFID-ready application is another advantage if your firm manages paper records, either from an onsite file room or at multiple offsite locations. If your firm uses specific labels for files and/or boxes, native label printing functionality reduces the headache of configuring label fields on another device or system. Printing directly from the RM software application ensures each new label created is associated with a record stored in the system. If your firm is considering upgrading its records management software and would like to learn more about other technology requirements, contact us today for a personalized demo of our solution.